Here’s where you tell your plug-in which frequencies to avoid in the course of adjusting the EQ (equalization). So when you apply low- or high-pass EQ, you’re telling the mixer to pass on certain frequencies. The low- and high-pass buttons are located at the far left and far right above the EQ graph in the following illustration. 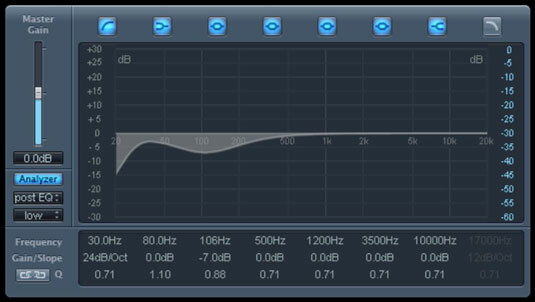 To use the low- or high-pass filter, click the appropriate button in the EQ window. In Pro Tools, you have two options: Freq and Q. The Freq setting is the frequency that the filter begins filtering. Any frequency below (high-pass) or above (low-pass) the setting is removed from the track. You can either type the frequency in the text box or use the knob to make your adjustment. The Q is the range of frequencies that your EQ will affect. With these filters, you can select among 6, 12, 18, and 24 decibels (dB) per octave. The higher the number, the more severe the filter. In Logic, you have the same three settings — frequency, gain/slope, and Q — as the rest of the EQ types. And as with the other EQ types, you adjust the settings by pointing your mouse over the column of the setting and clicking and dragging the parameter that you want to adjust. With the high-pass and low-pass EQ (filters), the gain/slope parameter adjusts the slope of the filter (how quickly it totally cuts off the frequency).